We’d love your help. 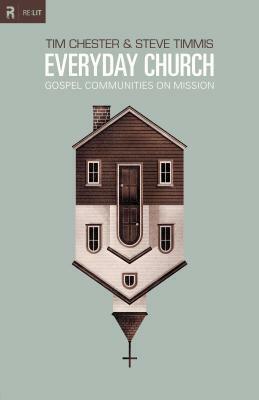 Let us know what’s wrong with this preview of Everyday Church by Tim Chester. To ask other readers questions about Everyday Church, please sign up. I have read a number of "missional" books and have been struggling to do it for years. I read Missional Church, Tangible Kingdom, Breaking the Missional Code, Planting Missional Churches, sections of Launching Missional Communities, attended conferences and all the rest. I have grown tired of it because in the end I wasn't sure how to actually do it and these guys just must be more gifted and sanctified than me. Center Church is the only exception and that is an exceptional book but more for the I have read a number of "missional" books and have been struggling to do it for years. I read Missional Church, Tangible Kingdom, Breaking the Missional Code, Planting Missional Churches, sections of Launching Missional Communities, attended conferences and all the rest. I have grown tired of it because in the end I wasn't sure how to actually do it and these guys just must be more gifted and sanctified than me. Center Church is the only exception and that is an exceptional book but more for the Elder/Pastor level than lay level. This is the most accessible and theologically well rounded, even handed, and basic of the bunch. If you want to do it, it as always won't be a how to model, but it will give basic every day principles to put into practice. It was a great reminder of the basics that make any good church do what God intended - focus on Jesus, walk in the Spirit, be diligent in prayer and the scriptures, and love people. This is also the only one, apart from Keller's Center Church that does not use the "incarnational" language. As Keller said, this is probably the best book to equip your people with basic every day missional principles without getting all weird theologically. Let me say upfront: “Everyday Church” is an excellent book, a much needed one! Authors Tim Chester and Steve Timmis argue that if we are to be Biblically faithful, we can no longer think of church as Sunday gathering alone, rather we must think of church as “a community of people who share life, ordinary life.” Further we can no longer think of mission as an event that happens in a church building, rather we must think of mission in the context of everyday life. The book is divided into 6 chapte Let me say upfront: “Everyday Church” is an excellent book, a much needed one! Authors Tim Chester and Steve Timmis argue that if we are to be Biblically faithful, we can no longer think of church as Sunday gathering alone, rather we must think of church as “a community of people who share life, ordinary life.” Further we can no longer think of mission as an event that happens in a church building, rather we must think of mission in the context of everyday life. The book is divided into 6 chapters and is essentially a practical commentary on 1 Peter. The chapters “Everyday Community” and “Everyday Mission” are the strongest chapters in the book and are full of practical wisdom. In the Chapter “Everyday Community”, they write, “It is hard for us to grasp the significance of this community identity because we live in a radically individualistic culture. We bring this worldview with us into the church so that it shapes our understanding of the gospel. So we have a loose connection with Christians on a Sunday, but then largely we go back to living our everyday lives on our own. No wonder we struggle to thrive. Our faith is animated on Sunday mornings as we sing God’s praise and hear his Word. But it limps along during the week when we live apart from the body of Christ.” Ouch! How true! They explain from 1 Peter that our new birth alienates us from culture, but being born again also places us into a new community. Thus “we are not called to live as isolated individuals alone on the margins”, but “we are born again into a new family”. And this they argue is not just God’s survival strategy for Christians on the margins, but also God’s missional strategy for the world around us. The Christian community is the living proof of the gospel! They write persuasively, “Mission must involve not only contact between unbelievers and individual Christians but between unbelievers and the Christian community. We want to build relationships with unbelievers – not in church buildings where we feel comfortable but on their territory. We also need to introduce people to the network of relationships that make up the believing community so that they see Christian community in action. People are often attracted to the Christian community before they are attracted to the Christian message.” Amen to that! In the chapter on “Everyday Mission”, they write, “Mission takes place not through attractional events but through attractional communities”. Lest they be misunderstood for their emphasis on mission through ordinary life, they emphasize that proclamations do matter (1 Peter 3:15), but the primary context for all such proclamation is everyday life. The Apostle Peter applies the same mission strategy in 1 Peter 2:11-12 asking us to live such good lives among the pagans that they may see our good deeds and ask us the reason for our hope (1 Peter 3:15). Peter then shows us where this mission takes place – in the neighborhood (1 Peter 2:13-17), in the workplace (1 Peter 2:18-25), in the home (1 Peter 3:1-7) -- not primarily in church gatherings! This is everyday mission! Of course, the authors don’t deny the place of gospel proclamation at church meetings, but their emphasis (and rightly so!) is on ordinary Christians living ordinary lives for the glory of God. They write, “When we think of evangelism, we should not first think of guest services, evangelistic courses, street preaching or door knocking. We should think of Gary at a meeting of the residents’ association. We should think of Hannah in her office. We should think of Sharon serving a meal to her husband.” And they ask if we could add the following to our daily, weekly and monthly routines: “Ask whether you could add: 1) a community component by involving another member of your Christian community; 2) a missional component by involving an unbeliever; 3) a gospel component by identifying opportunities to talk about Jesus.” This is a radical proposition - Community, mission and gospel together! Again, a hearty amen to that! For those who will say, “You don’t know how busy I already am!”, they quote Jonathan Dodson: “Missional is not an event we tack onto our already busy lives. It is our life. Mission should be the way we live, not something we add onto life…We can be missional in everyday ways without even overloading our schedules.” Some of Dodson’s eight suggestions include eating with non-Christians, being a regular at shopping malls or coffee shops, sharing common hobbys, volunteering with nonprofits, participating in city events, etc. The authors began with Christians being at the margins in the culture (Chapter 1) and end with the same theme (Chapter 6 - 1 Peter 3:8-5:14). They bring out the connection between the Christian community’s suffering and it’s glory in this chapter (which is also one of the main themes of 1 Peter). Suffering is normal for the Christian but glory will come. Meanwhile, we must be joyful in trials because of our association with the Savior, the care of our Father, the support of our church family and most importantly, the hope of glory. A fine, slim book by Tim Chester and Steve Timmis, two British church leaders. Organized loosely (and I can't emphasize the 'loosely' enough here) around 1 Peter, Chester and Timmis paint a persuasive picture of both the socially marginal station of today's church and also the way in which 'church' is a reality meant to be lived in everyday life, not merely occasional settings like Sunday worship or in extraordinary displays. The call is to move from "attractional events" to an "attractional com A fine, slim book by Tim Chester and Steve Timmis, two British church leaders. Organized loosely (and I can't emphasize the 'loosely' enough here) around 1 Peter, Chester and Timmis paint a persuasive picture of both the socially marginal station of today's church and also the way in which 'church' is a reality meant to be lived in everyday life, not merely occasional settings like Sunday worship or in extraordinary displays. The times they are a changin’. If America ever was a Christian nation, it certainly isn’t one now. It would do us good, therefore, to listen to conservative Christians whose nation is much further down the secularizing road we’re on. Tim Chester and Steve Timmis are two such men from one such nation: Britain. And they are here to tell their fellow Brits—and warn their brothers in America—that old methods of outreach which traded on the social cachet of the church will bring diminishing returns o The times they are a changin’. If America ever was a Christian nation, it certainly isn’t one now. It would do us good, therefore, to listen to conservative Christians whose nation is much further down the secularizing road we’re on. Tim Chester and Steve Timmis are two such men from one such nation: Britain. And they are here to tell their fellow Brits—and warn their brothers in America—that old methods of outreach which traded on the social cachet of the church will bring diminishing returns over time. But this book is not an apologia for more seeker-sensitive, church growth outreach models. At its heart, is quite old-fashioned. As in 2,000-years-old-fashioned. Simply put, the lost will not come to our churches in this post-Christian culture. We must go to them. “Sunday morning in church is the one place where evangelism cannot take place in our generation, because the lost are not there.”* We are missionaries to a foreign culture in our own land. Often Christians complain about the treatment of Christianity in the wider culture. They bemoan legislation that does not reflect Christian values. They lament the representation of Christianity in the media. They decry politicians who profess themselves atheists. We do not welcome any of these things, but none of them surprise us. We cannot expect the world to be like us. Indeed we are surprised whenever we do see the culture conforming to Christian values or reacting positively to the church. The tradition of nonconformist dissent has been replaced by middleclass conformity. We need to discover or recover the sense that if this year we are not imprisoned, then it has been a good year in which by the grace of God we have gotten off lightly. The changed cultural situation makes the New Testament epistle of 1 Peter peculiarly appropriate for modern Western Christians. The marginalization and suffering faced by Peter’s readers is already here, though in less violent doses than in Peter’s day (equally violent in the case in the majority world). So Chester and Timmis’ book is structured around an exposition of 1 Peter, an intriguing idea that does yield many insights. This calling on God’s people to attract the world to God through the quality of their life is precisely how Peter goes on to apply his allusions to the Old Testament: “Dear friends, I urge you, as aliens and strangers in the world, to abstain from sinful desires, which war against your soul. Live such good lives among the pagans that, though they accuse you of doing wrong, they may see your good deeds and glorify God on the day he visits us” (1 Pet. 2:11–12)…. This does not mean that good works on their own are sufficient. Proclamation matters. We are called to “declare” God’s praises (1 Pet. 2:9). We are to be ready to give “an answer to everyone who asks you to give the reason for the hope that [we] have” (1 Pet. 3:15). The gospel is a word, but the primary context in which that word is proclaimed is everyday life. The authors proceed to recommend various ways in which we can use our normal, daily routines to make natural connections with the lost (and saved) people in our communities. And various ways in which we can set up our communities to facilitate and create such opportunities. The authors are not under any illusions that a new method will solve all the difficulties in evangelism. But they do offer much wisdom about how to handle those difficulties. Enthusiasm for evangelism does not begin with evangelism at all. Exhortations to evangelize just leave us feeling useless. Driven by guilt we try turning the conversation at work around to spiritual things with horrible, crunching gear changes, or we knock on a few doors to little effect. So we give up. Again. And feel guilty. Again. They give humorous examples of such gear changes (“So you are watching [soccer] and you resort to saying things like, ‘At last a substitution. Did you know that Jesus could be your substitute?’ ‘Great goal. What about you? What’s the goal of your life?’ ‘Come on referee! That was never a penalty! Did you know Jesus paid the penalty for our sin?’"), and then they make the simple suggestion that the way to avoid them is not necessarily to learn better gospel pick-up lines but to 1) have the kind of love and 2) practice the kind of good works that get you a hearing. People may not come to you to ask you a reason for the hope that is in you. And, increasingly, they won't come to church to see the show you put on. They've got TV. But the church does have something to offer the watching world, something the world (and especially TV) doesn't have: a harmonious community of love. Christians collectively can cause people to question the reason for our hope. The book ends with suggestions on how to turn a church whose sole focus is Sunday services into a church which functions every day as a community. The authors are not "emergent." They are not opposed to monological preaching or to teaching authority. They don't say anything about soul patches. They are clearly theologically conservative. They also make good use of the resources of biblical scholarship in their handling of Scripture. And they don't write with the kind of pride that true innovations (emphasis on the nov-) can bring, but rather with the kind of confidence brought about by a recovery of scriptural emphases. And it's understandable that such a recovery might be taking place now, because our cultural circumstances have moved Westerners closer to those faced by Peter's readers. That insight alone was likely worth the price of the book, and it's one I'll explore as I read Peter's book in the future. I did feel at a few points that I was losing the 1 Peter thread, that he was trotted in when helpful and trotted back to the sidelines when not needed. But this is a relatively minor criticism; the book is not a formal exposition. My only other complaints center around a (very) few of the recommended activities for sharing life with non-Christians (and other Christians). The television shows they mention watching and at least one of the venues they recommend using for evangelism (namely a pub) seem to run counter to gospel purposes. The medium is the message, and those choices would, I believe, send a mixed one. And one last minor, quasi-complaint: It's a little difficult for me, having read the authors' first book, Total Church, to distinguish their two works. Their newer work seems to be rehashing a lot of the same themes. It was, perhaps, a bit less punchy. But a bit more convincing—largely because it made such insightful use of 1 Peter. I believe that Chester and Timmis have hit upon a vein of truth that we in our post-Christendom era would do well to mine. Really good read, especially since it's basically the model for summit college. Loosely based on 1 Peter. Rating just because I think his discussion on sharing in everyday conversation could be more direct and seems a little vague in light of calling people to a response. The basic premise of this book is that the way the western church operates is not the best way nor necessarily the biblical way to carry out the mission of the church. The concept that we live in a post-Christendom world is something I have understood vaguely for awhile now, although it hasn’t been defined with that term until reading this book. The effort and energy that I spent and others have spent in attempting to get back what we once had in the western church, a culture with an alliance of The basic premise of this book is that the way the western church operates is not the best way nor necessarily the biblical way to carry out the mission of the church. The concept that we live in a post-Christendom world is something I have understood vaguely for awhile now, although it hasn’t been defined with that term until reading this book. The effort and energy that I spent and others have spent in attempting to get back what we once had in the western church, a culture with an alliance of sorts between church and state in which most people have at least a vague acceptance and understanding of the basic tenets of Christianity, is not our primary calling as the people of God. I have been uncomfortable with the term “persecution” when referring to the trials we as Christians undergo in our culture since it seems to trivialize the sort of persecution that many throughout the world endure. However, the authors’ use of the term “marginalized” sums it up very well, I think. No longer can we expect to be afforded any special treatment by the culture. In fact, it is more normative that the church has been on the fringes. Another idea that I understood in a vague way but that was more fully explained throughout the book is the concept that we cannot expect the world to be like us or to care about the things of God. The authors write, “A Christendom mentality expects the world to be like us and share our values, and it protests when the world is not like us.” (Chester and Timmis, 2012). Again, this is an attitude I have had in my own life and have seen in many others. Striving to change the culture to be more moral is not our calling. I have never felt that church only takes place in church. I have always understood that one-on-one personal relationships are more important for the church’s mission and for evangelism than events. I understand there can be a place for loud, flashy events and that God can and does use them but I don’t see that as the norm and feel it often pushes people away more than draws them. The book raised a lot of questions in my own mind. First, the ideas he talks about seem to be mainly applicable to a city community. Since our church is in a rural area with one town in the center, it is harder for me to apply the concept of church community as part of a neighborhood or town. I personally live 12 miles from the church and I don’t know of anyone who is part of the church who lives near me. I do understand, and the authors state, that community isn’t necessarily geographical. But the ideas he proposes about “dropping in” on one another and even working together to influence your particular area don’t seem to fit with our particular situation. Another question that occurs to me is always my biggest question: How? The authors make it a point to say that programs should not drive the church and that community cannot be forced. Practically, I don’t know how to start. I understand that programs are not “bad” per se. It is a “program” of sorts that was the impetus for reading this book, after all. However, it is not necessarily “natural”. To start living this way may be unnatural at the start. The “how” is difficult to overcome because of many of the reasons stated by the authors. The independence and self-sufficiency that is culturally wired into us, and along with that comes pride, lead me to think I can and should be able to do it on my own, even though I know this isn’t the case. Fear of imposition is a huge hindrance. Excuses abound as well, such as working hours, husband’s schedule, and not wanting to impose. The book was a fairly easy read and incorporated a lot of good concepts. I do see a lot of this already happening in our church and other churches in the area. It helped me get a grasp on some vague notions I had and defined some new terms for me, which was helpful in clarifying my understanding. As an American Christian, I confess to being overly comfortable with my culture and overly sensitive to perceived threats to religious liberty and biblical values. In light of recent hostility by the U. S. Government toward Christian institutions (through mandated provision of contraceptive and abortifacient drugs for employees) and the apparent confirmation of these policies through the reelection of politicians who champion them, it is easy to see the Church’s influence waning in our society a As an American Christian, I confess to being overly comfortable with my culture and overly sensitive to perceived threats to religious liberty and biblical values. In light of recent hostility by the U. S. Government toward Christian institutions (through mandated provision of contraceptive and abortifacient drugs for employees) and the apparent confirmation of these policies through the reelection of politicians who champion them, it is easy to see the Church’s influence waning in our society and be tempted to anger or despair. In that frustration, Everyday Church was an excellent wake-up call, breathing Gospel life back into my understanding and expectations of the Church and its relation to culture. Timmis and Chester both serve as pastors in the United Kingdom, a country whose Christian heritage has all but disappeared, so their sound scriptural advice is also given the weight of experience. The authors’ premise is that the West is no longer “Christendom” but has become the mission field. Though this cliché has been around for many years, they argue that churches can no longer do evangelism and outreach in the West from the assumption that people have a basic knowledge of the Christian story and jargon. Instead, they propose treating the West as the mission field it is, adopting the methods and perseverance of pioneer missionaries who devote themselves to learning the values, habits, and language of the people they are called to in order to find out how best to reach them with the Gospel story. Over six chapters, Timmis and Chester build their case (mostly through an exposition of 1 Peter), showing how believers can reach their neighbors through engaging in the rhythms of their local communities and seeking to plant, water, and reap Gospel seed through living intentionally “as aliens and strangers” among their neighbors. They exhort churches to take their focus from programs and projects that consume all their members’ time (operating from an “if you build it they will come” approach to evangelism) and working instead to equip believers to reach their neighborhoods through plugging in to existing social structures. They remind readers frequently that ostracism and persecution are the norm for most Christians around the world (and throughout history), and that Westerners need to rediscover the faithfulness and boldness that comes from this. In particular, their chapter on "everyday evangelism" is a powerful encouragement to Gospel faithfulness. Rather than offering a "how-to" on presenting a spiritualized Gospel message to unbelievers, the authors recognize that those outside the church are often found somewhere along a continuum from complete lack of knowledge and interest in Christ to healthy skepticism on the verge of conversion. They suggest engaging a person at whatever point they find themselves along that line, listening well, asking pointed questions, and naturally exposing them to the true Gospel to help move them closer to Christ--this changes the goal from programmatically "sealing the deal" of their salvation to actually loving them and modeling Christ to them to make them a disciple. Very profitable book. Has 1 Peter running all through it, and makes connections between the situation of the exiles in the first century and the situation of Christians in the UK and (a few years behind) in the US. Their contention is that event based come-to-church evangelism works best when a culture that respects the church, and that we've lost that cultural moment. In it's place, the authors argue for "everyday church", thinking of and living as Christians in ordinary relationships with neig Very profitable book. Has 1 Peter running all through it, and makes connections between the situation of the exiles in the first century and the situation of Christians in the UK and (a few years behind) in the US. Their contention is that event based come-to-church evangelism works best when a culture that respects the church, and that we've lost that cultural moment. In it's place, the authors argue for "everyday church", thinking of and living as Christians in ordinary relationships with neighbors and friends. The challenge is for Christians to see themselves as the primary agents of mission, rather than the pastor or the guest speaker at a big event. The necessary foundation for this type of ministry is an active community life where the gospel is being lived out: sin-confession-forgiveness, praying together, studying the Bible together, serving others together. I made an agreement with myself to not use the public library this summer, but to read through the 20+ unread books that had gathered in stacks around my house the last couple of years. Several of the unread books -- like this title -- fall under the category of "how to be the Church now that no one goes to church", which I typically approach with a fair amount of skepticism and a dash of hope. I had special hope for this book because I had so much enjoyed Tim Chester's A Meal With Jesus back whe I made an agreement with myself to not use the public library this summer, but to read through the 20+ unread books that had gathered in stacks around my house the last couple of years. Several of the unread books -- like this title -- fall under the category of "how to be the Church now that no one goes to church", which I typically approach with a fair amount of skepticism and a dash of hope. I had special hope for this book because I had so much enjoyed Tim Chester's A Meal With Jesus back when we first moved to Austin in 2011. And it's not to say that I didn't like Everyday Church; it's just that I didn't find it especially unique or illuminating. A very practical and insightful book. I appreciated the provocative statements and push backs against past and current 'models' of church. Chester and Timmins exposit the book of 1 Peter to demonstrate what Christian fellowship and community should look like. They are not concerned with creating new "programs" in which to squish people into. All too often, churches can tend to start programs which their people must serve, rather than programs which actually serve the people. They put it this way, "Programs are what we create when Christians are not doing what they're supposed to do in everyday life." This book was quite insightful, Chester and Timmins exposit the book of 1 Peter to demonstrate what Christian fellowship and community should look like. They are not concerned with creating new "programs" in which to squish people into. All too often, churches can tend to start programs which their people must serve, rather than programs which actually serve the people. They put it this way, "Programs are what we create when Christians are not doing what they're supposed to do in everyday life." This book was quite insightful, a refreshing reminder that Christian community need not be complicated or overly "programmatic." Humans are organic, but this does not mean there shouldn't be any sort of organizational ordering of our fellowship and interaction. However, it ought to go "with the grain" of everyday life. Rather than piling on the burden of more meetings, programs and events, Chester and Timmins remind us, "It is not simply that ordinary Christians live good lives that enable them to invite friends to evangelistic events. Our lives are the evangelistic events." Tim Chester and Steve Timmis have probably done more than anyone else (excluding Tim Keller and Jeff Vanderstelt) to help me understand what applying the gospel to everyday life looks like. Their first book, Total Church, rocked my face off. And Everyday Church is more of the same. What is a Missional Community anyway? I began planting a church about two years ago, and it 19s been the hardest thing I 19ve ever done. One of the things we knew we wanted to do while planting Basileia Church was to have missional communities. But to be honest, none of us completely understood what missional communities were, we just knew they sounded awesome. Our first concept was that it was an outreach thing and a numbers thing. In other words, in our minds a missional community was a small group that tried to reach people, and it was a larger small group (20ish people instead of 10). That 19s a stupid idea I know, but that 19s what we thought. It wasn 19t until a few of us heard Jeff Vanderstelt, Steve Timmis, and Jonathan Dodson begin explaining missional communities that we really began to understand what they were. When I read Total Church, the picture started coming together more and more. And when I finally began trying to incorporate all these ideas into the life of our church, and God began doing really cool things because we started praying more, that I really understood. Things got clearer, and they 19re still getting clearer, and we 19re still learning. I 19ve always known and understood that evangelism is something I should do, but I 19ve never been very good at doing it. I 19ve shared the gospel a fair amount, and I 19ve seen some people follow Jesus as a result, but I 19m willing to say that at least 85% of the time evangelism felt weird and contrived. I believed what I was saying, I just never really believed that the way I was going about it was actually very effective. I lean reformed doctrinally, so I was confident that God was working everything out and would draw people to Himself, but I still felt like there was more to it. And I think there was more; it 19s this idea of missional living, missional community, and everyday church that made things feel authentic and real. Instead of evangelism being an event, it was a way of life. In college I was part of a community of believers that really loved one another and where we honestly pushed one another towards godliness. And I 19ve got to say it was awesome; I wouldn 19t trade those years for anything. And I don 19t think it was just because it was college. It was the friendships, and the desire to see one another walk with God, and learning how to use our gifts for God, and the sense that we had real brothers and sisters in the faith who loved one another. But there was an element missing. It was mission. A lot of what we did in college was self-centered. I didn 19t even really realize it at the time. But our group never reached out very well. And we didn 19t even realize we were blowing it; we were seeking to be the best Christians that we knew how to be. Our experience in church was that evangelism was this 1Csecond or third tier 1D thing that no one really did, except occasionally. We thought God just wanted you to know His word, and sing great worship songs, and maybe go on a mission trip, and not sleep with our girlfriends / boyfriends until marriage. But everyday mission was a foreign concept. Evangelism, if we did it, was this separate event where you shared the Roman 19s Road. It definitely wasn 19t a part of everyday life. This honestly was a great community, but it wasn 19t a missional community. The thing that makes evangelism feel natural is doing it all the time as part of your everyday life. It 19s learning how much you still need the gospel, and how much your buddies still need the gospel, and how much your neighbors need the gospel, and learning how to talk about the gospel and challenge yourself to put faith in Jesus all the time. Sometimes people will argue that 1Cfriendship evangelism 1D doesn 19t work; it 19s jus an excuse to be lazy. I mean you can 19t just be a designated driver for your plastered college buddies all the time, without ever sharing the message of Jesus, and expect them to come to faith. That 19s true. But missional living isn 19t friendship evangelism as I just described it. Instead, it 19s learning that you are a missionary all the time. I 19m learning to redeem every part of my day for the purposes of God. Rather than evangelism being something that I (at best) do once a week for a few hours, it 19s something I 19m trying to do all the time. And it 19s something our whole community participates in together. For me, this has made all the difference in the world. Evangelism no longer seems contrived, but genuine. I 19m part of a group of believers who love one another and who are on mission together for the good of the community in which we 19re planted. We want to bless the community and see our neighbors and friends and acquaintances come to know Jesus. We 19re learning how the gospel message is what 19s needed in every situation. We don 19t behavior modification, we need Jesus 19 grace. And we 19re learning to pray a lot. I need God to work all the time. I need Him to make things happen. I can 19t do anything on my own. At this point I know I 19m not really reviewing Everyday Church, I 19m just telling you how I 19ve been inspired and instructed by it. In a nutshell, it 19s a follow up to Chester and Timmis 19 first book, Total Church. One big difference between the two books is that Everyday Church is based loosely on 1 Peter, where as Total Church is a more systematic explanation of what a missional church looks like. I love both books. Everyday Church goes through 1 Peter because it 19s one of the most instructive books in the New Testament for describing how the people of God should live as missionaries in the midst of a culture that it continually finds itself more and more at odds with. Instead of getting in the nitty gritty of the book, let me just say, 1CYou should read it. 1D You should read Total Church too. They 19re both life-transforming, and I don 19t say that lightly. Perhaps my ramblings on this blog post demonstrate how much I love this book, and I hope they have inspired you to check it out too. It is a call for us to be an everyday church with an everyday mission.We need to shift our focus from putting on attractional events to creating attractional communities. (p. 10). They also see an opportunity because it’s now less advantageous to be “Christian” which allows the church to work with those who are committed to the mission of Jesus (p. 13). I also appreciated that the entire book was strucutred around Scripture. They take 1 Peter and work their way through what Peter says to the dispersed and marginalized church of his day. That is so rare today especially for books which have the level of practical impetus that Everday Church has. At the heart of our vision is not a new way of doing events but the creation of word-centered gospel communities in which people are sharing life with one another and with unbelievers, seeking to bless their neighborhoods, “gospeling” one another and sharing the good news with unbelievers. The context for this gospel-centered commu- nity and mission is not events but ordinary, everyday life. Yes, yes, and yes. We need exactly this kind of evangelism that penetrates to the darkness gutters of our hearts. The spoken word in church is minimized in favor of deeds (justice, mercy, private gospeling, etc). Those statements though were just a few shards of the broken stained-glass window. I agree we must have missional living, good neighboring, and everyday gospel but not at the expanse of the primacy of preaching. I read this book alongside my growth group as we studied what it would look like to be a community that seeks to live out the gospel message everyday. We learned so much from it as a group and as individuals, as it challenged us to face various aspects of our lives. Everyday Church pointed out areas where each of us struggle in missional, relational, and personal senses. We learned what it looks like to truly be living in community and ways we can implement it further. Overall, this was an excelle I read this book alongside my growth group as we studied what it would look like to be a community that seeks to live out the gospel message everyday. We learned so much from it as a group and as individuals, as it challenged us to face various aspects of our lives. Surprisingly thick with theological observations, practical insights, and good exposition, this is a book I was glad to read and recommend it with pleasure. For Christians in the US (and much of the West with a similar mindset) who think the best approach to welcoming people into the gospel is to "get them to come back to church," this book will help you reevaluate that approach in big and small ways. A convincing presentation of ideas on how followers of Jesus can de-programitize their ministry Surprisingly thick with theological observations, practical insights, and good exposition, this is a book I was glad to read and recommend it with pleasure. For Christians in the US (and much of the West with a similar mindset) who think the best approach to welcoming people into the gospel is to "get them to come back to church," this book will help you reevaluate that approach in big and small ways. They get it. Simple as that. The church cannot afford to continue functioning like Christendom still exists. We are on the margins. And that is a good thing. They advocate for putting our efforts into developing attractional communities not attractional events. There is a lot of unlearning ahead for the church in the West -- particularly America. But Chester and Timmis, on the grounds of I Peter in particular, point us in the way to go. Great thesis of living intentionally in every aspect of your life. Very challenging. Although it’s a short book i think it’s too long. The point is made in the first few chapters and the rest just seems like it’s filling space. Some very good practical points but I would say I enjoyed parts of the book more than the book as a whole. Incredible book. I would recommend this to anyone seeking to understand and display a gospel-centered community (church). The use of scripture was also insane, and I appreciated the reliance on the Word. This book helped me examine how I am living as the church “everyday” and was super convicting and encouraging. Between this and "Total Church," Chester and Timmis have pointed to a revolutionary view of church that brings it back to what it was always meant to be. They're the two best books on church and ministry that I've read. Inspiring to think about engaging the local communities with the gospel. I would love to know more about how to do this on the Commuter Belt, where both time, and geographical proximity, is a luxury rather than a given. This detailed the shift between attraction and missional church, and used 1 Peter to help me see what church on the margins looks like. The section on Everyday Pastoral Care and Everyday Evangelism did an exceptional job on Gospel application. A great read for small groups and churches in general! Extremely challenging in thought of how we do church and community. Extremely helpful. The Scriptures are the base from which application is discovered. Also helpful to think about where western culture is going. A foundational book that shaped my understanding of church, community, and the centrality of the gospel. Similar, but better than Total Church in my opinion. Dr Tim Chester is involved in The Crowded House, a church planting initiative in Sheffield, UK. He was previously Research & Policy Director for Tearfund UK, and has been published widely on prayer, mission, social issues and theology. He is married to Helen and has two daughters.